Doctor Who: The Last Temptation Of Tegan | Warped Factor - Words in the Key of Geek. 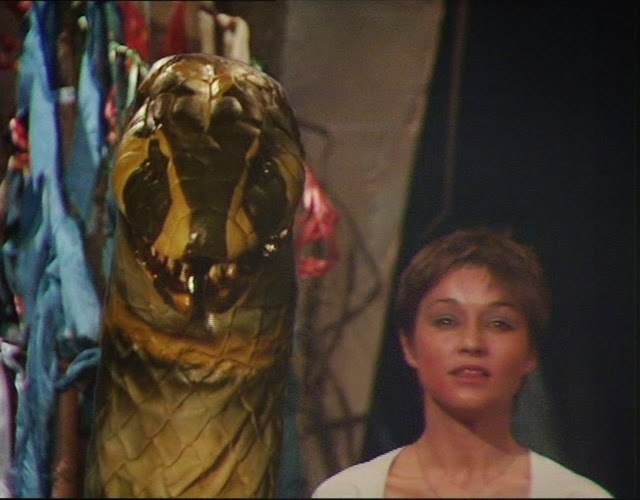 Take a seat among the pews as we revisit the Last Temptation Of Tegan, perhaps better known as the Kinda/Snakedance double header! 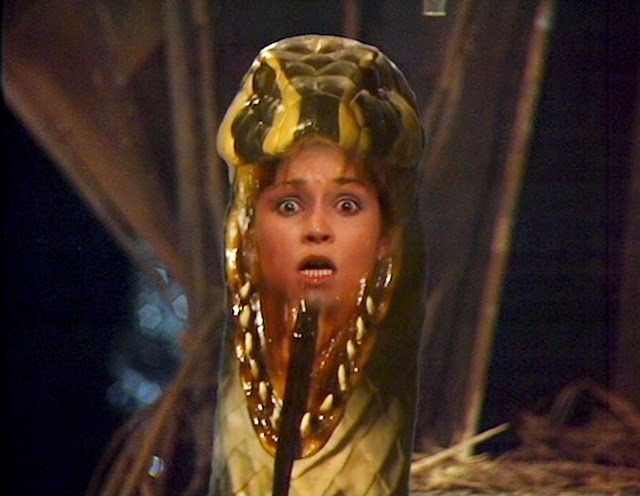 The Mara, the snake which possesses her, should have a particular resonance for any armchair theologians amongst you- especially when it comes to what is known in Biblical terms as The Fall or Fall Of Man, when Eve takes a bite out of a certain fortuitous piece of fruit. Despite the myth that it was recorded as being an apple there is no clear evidence to support the claim! "Adam loved Eve, but she was later seduced by the serpent, who was actually Satan, the one who rebelled against the Most High God and the one who leads the evil spirits in their rebellion against the Kingdom of Heaven and God's purposes. Eve was deceived and she ate of the forbidden fruit (the Bible doesn't say what kind of fruit it was). Then Adam, who was with her, chose to eat of the fruit also and they sinned. When they sinned, spiritual and physical death came into the world and fellowship with God was broken. Like a rose being plucked off the vine, they were immediately disconnected from their source of life." LON: It's not just Ambril, mother, it's all of it. The ceremony and everything. It's all such nonsense, isn't it. LON: Of course it is. And all so long ago. The Mara was destroyed five hundred years ago and yet we're still celebrating it. Why? TANHA: Oh, once every ten years. LON: It occurs to me that the whole thing is kept going solely to remind the people here how much better life is under the rule of the Federation. TANHA: And so it is. TANHA: Of course it is. Life under the Mara must have been gruesome in the extreme. I mean, look Oh, it is grotesque. You ought to take more interest in our heritage. TANHA: Well, it's the root of our culture. The Legend of the Return. Although, now what was the man's name? Well, the Director before Ambril, he didn't think it was just a legend. He thought the Mara really would return. LON: Am I now supposed to take the ramblings of a mad man seriously? LON: The Mara was destroyed, not banished to another dimension. It won't return in a dream or in any other form. TANHA: If you say so. LON: I think I just have. TANHA: Well, it made a good story. Quite made my hair stand on end. Ambril's predecessor was rather good value, even if he was talking nonsense. Later events of course lend resonance to the idea that 'You are free to eat from any tree in the garden; but you must not eat from the tree of the knowledge of good and evil, for when you eat from it you will certainly die.' Most definitely when its the Mara offering you sustenance. 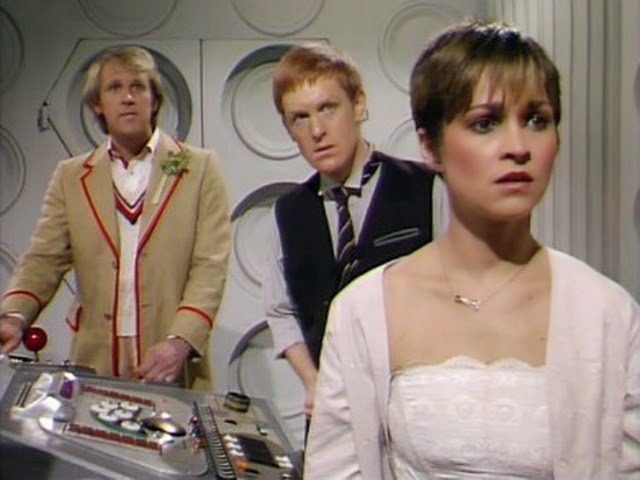 TEGAN: I'm still possessed, aren't I, Doctor? The Mara from the world of the Kinda is still inside my head somewhere, isn't it? DOCTOR: We'll have to see. TEGAN: But you think so. DOCTOR: It does seem likely. I'm sorry. DOCTOR: Well, obviously below the threshold of conscious thought. I would imagine that when awake your mind is still strong enough to resist, but in sleep it loosens its grip and battle is joined. TEGAN: The battle for what? DOCTOR: For control. Come over here. It's possible the Mara seized temporary control and brought itself home. Now, insert the earpiece, try to relax, and when switched on, listen to the sound. Of course she first fell under its influence on Deva Loka, bearing the mark of the snake! DOCTOR: Isn't it obvious? Your mind and body were occupied by the Mara, which found its path to this world through your dream, just as Karuna said. 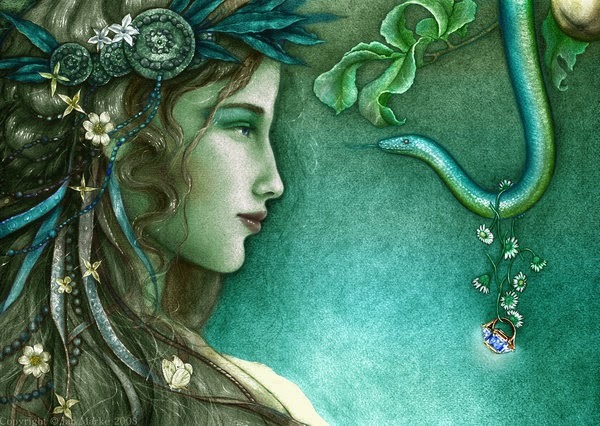 But allowing it into her mind proves dangerous, just as listening to the serpent in the Garden of Eden did in Eve's case. The Mara is of course similarly banished- Back to the dark places of the inside, or wherever. But not here, not anywhere here. Then once more, after the first time proves not enough to contain it! TEGAN ( posessed): What is happening? Who dares to interrupt the Becoming? Who does not believe? Submit. All minds must submit. Look at me. You must look at me. You cannot resist. It is impossible. No! Stop him! He must be stopped. Help me, Doctor. What's happening to me? Please, look at me, Doctor. I need your help. DOCTOR: No, I will not submit. She's then freed from the Mara's control. TEGAN: It was awful. It was awful. DOCTOR: It's all right. It's all over now. TEGAN: The feelings of hate and rage. It was terrible. I wanted to destroy everything. DOCTOR: Well, you're free of it now. TEGAN: The Mara's gone for ever? DOCTOR: Yes. The Mara has been destroyed.